Innovation is considered to be an important determinant of performance at the firm, industry and country level. This view is supported by empirical evidence showing the importance of innovative activities on firm and industry performance and country growth rates. The majority of the world’s R&D is concentrated in a handful of countries however, meaning that domestic innovation is of little importance for most countries. Such countries can benefit from innovation conducted elsewhere however, if knowledge and technology is diffused across borders. 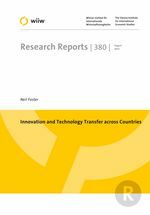 In this paper we survey existing literature on innovation and technology diffusion and discuss descriptive statistics on the extent of innovation and technology diffusion across countries to provide insights into the likely developments in innovation and diffusion.